I am participating in a program with Stampin' Up! designed to help demonstrators build their business. 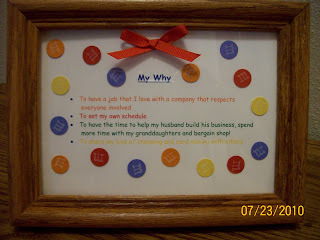 Part of our first assignmet was to create a "My Story" and a "My Why", as well as book a workshop and sign up a new demonstrator. 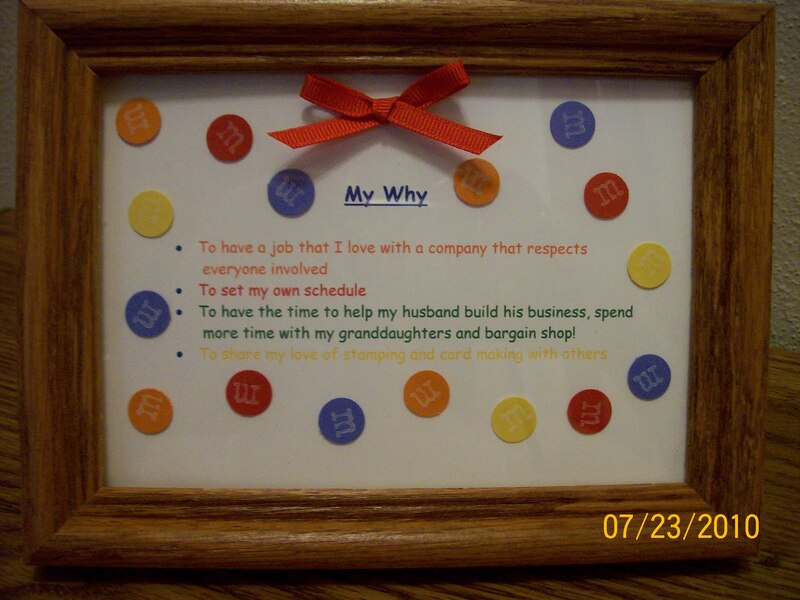 We are supposed to display our "My Why" story in our stamping area in our home and share at our workshops. My craft room is decorated in M&M's. For the "m" I used our Rough Type stamp set. My aunt introduced me to Stampin’ Up! about 12 years ago when she first started selling. At that time I was just getting into scrapbooking. I really enjoyed the workshop and loved the products, but didn’t have a lot of money to invest. With her living out of town, I didn’t get to do as much as I would have liked. I’d not been to a workshop since, but when things started declining rapidly at my full-time job, I decided in February (2010) to quit and become a Stampin’ Up! Demonstrator. 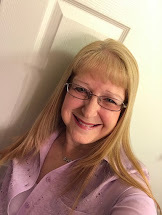 I’m looking forward to meeting new people, learning new techniques and growing my business by sharing my love of stamping and card making through workshops, classes, clubs and recruiting. Thank you for sharing. I am following through SC. Good luck and God Bless. Ok, after I left the last comment, I took another look at your "My Why" and and I said ...No WAY!!! You are an M&M collector too?! I need to see your stash. I will send you pics of my collection. I used to have it in my office, then it was too much to dust, then the kids couldn't stop playing with them. Then they went ontop my fireplace mantel (4 way fireplace), and there wasn't enough room for it all. So my husband redesigned a Gun Cabinet (that my dad gave him) for me to store my collection. I have since stopped collecting, no more room in cabinet, plus I got a new hobby (SU). I still think I am missing some pieces, in fact I know I am, but no one will confess. Anyway, I would like to see your stash, probably bigger than mine. Take care and God Bless. Thanks Kelly! Following you through SC.